Alongside its 18th edition, Internetics Festival, a project initiated by The Institute and presented by UniCredit Bank, aims to celebrate the digital industry through a virtual reality (VR), augmented reality (AR) and digital installations exhibition – Internetics Interactive Expo. The event is organized between 22-25th of November at The Institute Space, 12 Dacia Boulevard, in Cartierul Creativ (The Creative Quarter). Public access is free between 10:00-22:00, with the exception of November 22nd, when the opening hours are 19:00-23:00. You can find more information about the exhibition and the structure of the competition on the official site of the festival, www.internetics.ro. 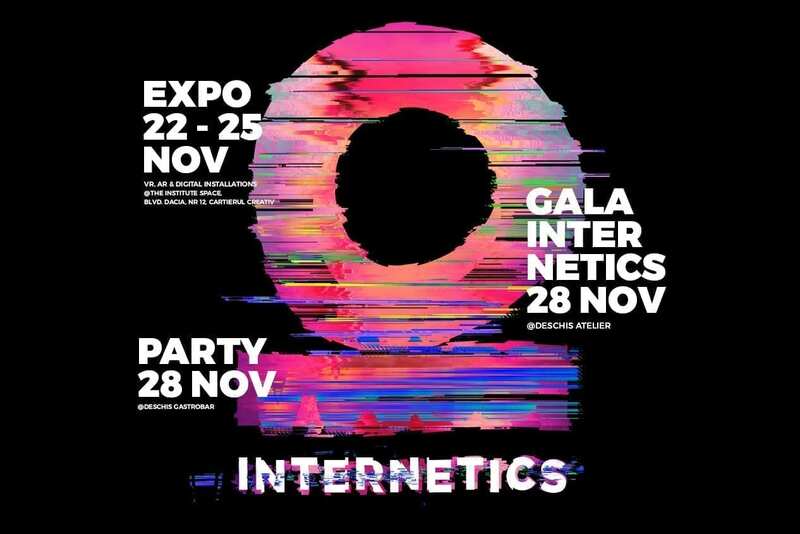 Founded and organized by The Institute, Internetics is the first branding, marketing and online advertising festival, that settles the standards in online communication in Romania, by rewarding the best interactive campaigns, technologies, sites and tools used in online promotion and encouraging both creativity and strategy. Internetics appeared since the start of the online industry in Romania, in 2001. It contributes to the development and improvement of the online and digital industry in Romania. The Institute promotes the local creative industries, aiming to contribute in modernizing Romania. The Institute creates and organizes events for 20 years now and brings together designers, entrepreneurs and the audience of creative industries. Through everything we do we contribute to building a strong infrastructure for developing creative industries, we grow and diversify the audience of workshops, designers, small businesses, agencies and manufactures, we promote creative entrepreneurs in Romania and in the region. It founded Romanian Design Week, AdPrint, Internetics, Institute, The Magazine, Noaptea Agenţiilor, is the organiser of Effie Awards România, Şcoala ADC*RO and ADC*RO Awards. UniCredit Bank is part of UniCredit, a strong Pan-European Group with a simple commercial banking model and a fully plugged in Corporate & Investment Bank, delivering its unique Western, Central and Eastern European network to its extensive 26 million strong client franchise. UniCredit offers local expertise as well as international reach and accompanies and supports its clients globally, providing clients with unparalleled access to leading banks in its 14 core markets such as Italy, Germany, Austria, Bosnia and Herzegovina, Bulgaria, Croatia, Czech Republic, Hungary, Romania, Russia, Slovakia, Slovenia, Serbia, Turkey. Based on an international range of branches, UniCredit maintains relationships with clients from 18 countries around the world. The group is present in Romania through: UniCredit Bank, UniCredit Consumer Financing, UniCredit Leasing Corporation, UniCredit Insurance Broker, UniCredit Leasing Fleet Management and UniCredit Services.